My Physical Therapy is Over—Now What? Home exercise is a critical part of a physical therapy plan of care. Stretches and strengthening at home can speed up recovery and help prevent re-injury. In between sessions and after you are discharged from physical therapy, you may be wondering what is next? How do I make sure to not regress between sessions? What can I do to prevent this injury from happening again? How can I continue to gain strength/endurance/mobility? Your work is not over when you walk out the doors of the physical therapy clinic. Your physical therapist will work with you to develop a home program to keep you at your best. Soon after your first physical therapy assessment, a home exercise program with a few basic exercises may be provided to you and will be expanded upon as treatment progresses. These exercises will serve two major purposes in making the most of your rehabilitation. The first of which is to make sure that gains made in physical therapy sessions are retained in between treatments. Plans of care vary with patients coming in anywhere between one to three times per week. By working on your home exercise program, improvements made in a treatment session should carry over with minimal setbacks. For example, post-operative knee patients will often be given range of motion exercises to perform at home. By performing these exercises daily, stiffness and pain can be decreased between treatments. The second advantage to performing home exercises is that it can help speed up recovery. Working towards your range of motion goals, improving muscle recruitment, and addressing flexibility deficits as directed by your therapist in your home exercise program can help your body recover faster to get you back to the activities you enjoy. It is important, however, to listen to your therapist about restrictions in movement and exercises. Overdoing it and putting too much stress on healing tissues can impede recovery. As much as therapists love their patients, there comes a point when it is time to discharge them from formal physical therapy into an independent home exercise program. 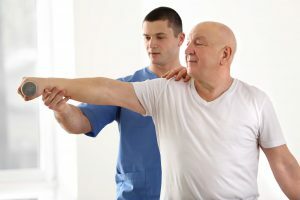 Just important as the techniques used while you are in therapy, is the physical therapist’s job of educating and developing a home program for a patient to continue after discharge. There is a reason injury occurred in the first place. Therefore, it is important to maintain what was gained in therapy and continue to prevent re-injury. One example is for patients with lower back pain. Lower back pain is often caused by muscle imbalance, tightness in the hips, and ineffective recruitment of core muscles. After a physical therapist has helped you relieve your lower back pain, continuing with stretches and core stability exercises are critical to prevent re-injury and flare-ups of your pain. Your home exercise program does not have to be time consuming. Often, time efficient and easy exercises performed consistently produce amazing results. Have you had a nagging injury that you have been ignoring? Are you tired of not being able to participate in activities you once enjoyed? Call Bourassa & Associates today. We offer same day appointments with our university trained therapists who can not only help you with your condition but will also provide you with individualized home programs to keep you active.